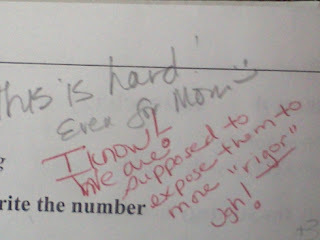 So parents: have you noticed that your children’s math homework is much more difficult this year? Are you having problems helping your child? Welcome to Common Core math. This new education reform is permeating our children’s classrooms and the result is not pretty. Forty-four states and D.C. have signed on to the Common Core Standards, many for the opportunity to get the Race to the Top bribes, er, grants. Ask any veteran teacher: there have been many educational movements that have come and gone over the years. As time goes on these new programs fade into the background and new revolutionary ideas appear promising to improve our children’s educational outcomes. The massive undertaking of the Common Core is unprecedented in terms of widespread use and financial commitment. So how will the Common Core affect your child? In math look for much more difficult work. Students may be asked to understand concepts that may not be appropriate to their age or grade level. As an educator I try to challenge my students as much as possible, but I also understand their individual limitations. Teachers in my district, community and education network are finding themselves and their students very frustrated. from my son’s second grade teacher. My children are fortunate(at times!) to have a two educator household. We try our best to have our children complete their homework independently, but find that some of the math requires our help. 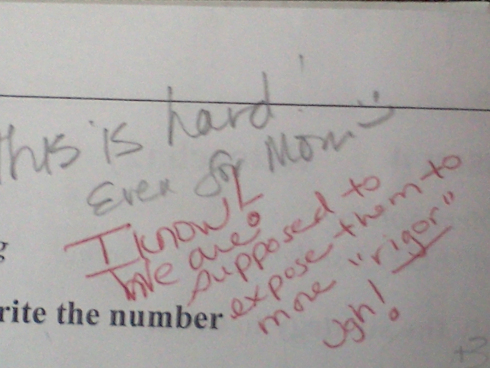 At times some of the problems with increased “rigor” are challenging for adults. My children do well in school, yet find some of the “new” math very difficult. With increasing class sizes, teachers will find it difficult to assist all students. Are we creating another educational divide between the haves and have-nots? The Common Core push for “rigor” is putting teachers under the gun to move on to new topics before all children may be ready. The Common Core blues are not just restricted to math: do not forget writing as well. In this case your child may just complain of boredom. In ELA, a major concern is the use of “informational text” instead of fiction. Will our children lose the great tales, short stories and novels that we still remember as adults? The classic stories and novels provoke critical thinking, imagination and creativity. Reading a factual passage will not help our children succeed. The Common Core will also lead to an explosion of high-stakes standardized testing, the likes of which we have never seen before. Before the vast majority of students in our nation are forced under an educational experiment, should not a pilot study be completed first? If the Common Core is such a tremendous idea, why hasn't it been widely embraced by private schools? What can you do as a parent? Talk to other parents. I bet they are experiencing similar homework issues. Complain to your local school board. Contact your elected leaders. Expose the amount of money being spent on an experimental education program that was not created by educators. The profit motive from creating new curriculum materials, textbooks and tests will be difficult to overcome, but we have no choice as our children’s future is at stake.